The Philadelphia Union have scored 3 goals in the last 6 games, being shutout in 3 times for a 0–3–3 record. Only 1 goal, a Chicago own goal, came from open play with the other 2 coming from free kick situations. Over that same period, the Union have allowed 8 goals. Compare this with the first six games under then interim manager John Hackworth, when they scored 12 goals and were shutout once for a 4–2–0 record while allowing 5 goals. In an article posted in the beginning of August, I looked at what was going right under Hackworth compared to under Nowak. One of the areas that I focused on was the improved numbers for shots, shots on goal, and goals. To the left is the chart I came up with, which shows clear improvement across each category. Interestingly, while the number of goals, as well as the scoring percentages, have dramatically declined over the last six games, the averages for shots and shots on goal have actually increased. However, while the number of shots on goal have increased, the percentage of shots that are on target has actually decreased by 10 percent compared to the first eight games under Hackworth. It isn’t hard to think of recent examples of obvious examples of obvious goal scoring opportunities that have gone high and/or wide. So, 14 games into the Hackworth era, the team’s stats for goals and shots, much like the team’s overall record, remains improved compared to Nowak. However, the differences that were so apparent after the first 6 games under Hackworth have narrowed. The Union’s recent lack of goals, the honeymoon period after Hackworth took over excepted, is of course part of a season-long trend. (It would be easy to argue that it is part of trend that has largely existed since the club’s first season.) The Union are currently next to last in the league for goals scored, and last in the league for assists, shots and shots on goal. While they have 5 more goals than Chivas USA, and have 2 fewer than Portland’s 27 goals, they also have 6 fewer assists than Chivas USA. The gap between the Union and league leader in assists San Jose is an incredible 43 assists. In fact, Seattle’s Mauro Rosales has only 2 fewer assists than the entire Union squad. Even with its difficulties, the bright spot for the Union has been the defense, which is second in the league (tied with Columbus) for fewest goals allowed and at 30 is 6 behind league-leading Kansas City. But the Union’s inability to score gives them a goal difference of -5, which ties them with New England for the 8th worst in the conference, 13th in the league. Readers have commented recently with questions about the Union’s stats for shots, so I have created the table below for easy reference. One thing that jumps out is that, although he only has 4 appearances so far, Danny Cruz has 11 shots. One hopes his willingness to shoot is contagious. 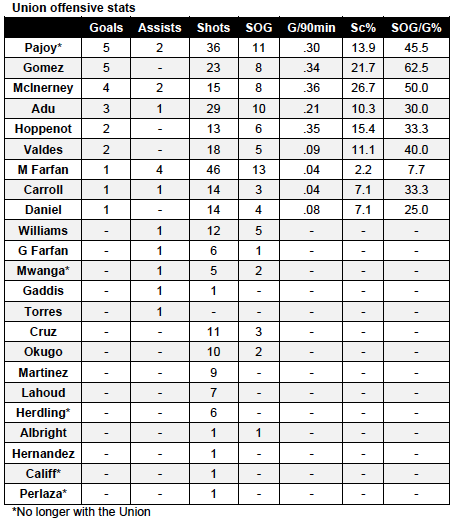 It is interesting to note that at the end of the 2011 season, 16 Union players had scored for a total of 44 goals and 38 assists from 407 shots and 135 shots on goal. With 9 games left to play in the 2012 season, only 9 players have scored. Great work n analysis! You add to the community understanding of soccer context…. Where do you gather your stats from. I’d like to do some analysis of my own, but I don’t know where to go. Are you going to each team’s stat page or is there a website out there with all the data already gathered together? …asked the young grasshopper of PSP’s Obi-Wan. I’m happy you find the info interesting! I go through the chalkboards of every game (helps if you start recording info at the beginning of the season!) as well as the stat pages on the Union and league site. Sometimes, particularly with passing stats but also with shots & shots on goal, the chalkboard and the stat page for each game have different numbers. I’ve come to prefer the chalkboard for player stats because it provides visual evidence of a particular event being recorded. If you are interested in sharing your analysis with PSPs readers, send me an email at efarnsworth@phillysoccerpage.com. We’d be happy to post your insights. Thanks for the info. I’ve been thinking about trying to find trends between minutes or years played vs player performance. For example, in the NFL it is a league trend that wide receivers tend to have breakout years in their 3rd year. I think this might help identify useful bench players or trades, especially at positions like striker and goalkeeper where performance is easily calculated with goals scored or allowed. Just think, it’s Okugo’s and JackMac’s third year. Maybe next year (MacMath’s 3rd year) will be a breakout year for him (assuming 3 is the trend across the league). Just something I’ve been thinking about. Interesting idea Matt but it may prove difficult to implement. In most of the world, football is essentially a continuum from the top flight down through the lower levels. The difference between NCAA and NFL is huge, and at the high-skill positions the difference is staggering; it’s truly a challenge trying to predict who will be successful in the NFL. I think you may find that for most footballers there is no “breakout year” because they dominate at every level until they reach the top, but perhaps you will prove me wrong. I’ve kept stats for every game, both individual and team, since the inaugural season. I’ll investigate the stats and see if I can find any trends, but I think the 3rd-year trend is more typical when that player plays consistently through the first 2 years. Jack was played sparingly in 2010 then barely at all this year until Hackworth took over so the stats may be skewed a bit. I’ll see if I can find anything though. Steve, how has the introduction of the chalkboard following the start of last season affected your stat keeping? The basic stats that were available before that seem so thin now. As I said to Matt, we would be very happy to share your statistical insights with PSP readers if you would like to write something.